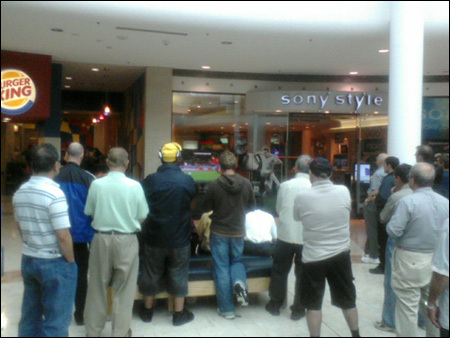 When I was over at the mall on Wednesday I noticed a group of people gathered in front of the Sony Style store across from the food court watching the Spain vs. Switzerland match. So I wandered over and stood watching the final ten minutes of the game (yay, Switzerland!). The crowd was much larger by the very end and though there was no sound everyone was paying rapt attention to the screen as though they had a personal stake in the outcome. Canada doesn't have a team in the current World Cup and have only qualified once, back in 1986. But this doesn't stop us from watching and cheering on the participating countries. In some ways I think not having a team of our own allows us to engage with the competition on a more international level. We can cheer for the team of our homeland, or land of our ancestors, or the spirited underdog, or a country we've visited and/or admire, or the team of a player we love. And thankfully there's tons of World Cup time left so we have a lot of games to look forward to. * Random Buzzers: Ask C.K. Kelly Martin a Question! I saw an amazingly truthful movie last night—my second British coming of age film about a teenage girl in three days (the other was An Education, which I also really enjoyed)—that I want to rave about. If you can handle realistic, gritty and raw you should think about getting your hands on Fish Tank, the story of fifteen-year-old Mia (played by Katie Jarvis in a knockout performance), an aspiring hip-hop dancer who has been kicked out of school and is weighed down by her low income neighbourhood, a mother who doesn't seem to give two shits about her and her own isolation. But Mia is also stunningly brave and hungry for a real connection with someone. At first it seems as though her mother's new boyfriend (played by Michael Fassbender who awed me in Hunger where he played IRA Hunger striker Bobby Sands) could be a positive influence on young Mia but as their relationship veers closer to boundaries that shouldn't be crossed we begin to wonder if this is yet another problem for Mia rather than part of a solution. I spent the final third of the film with my stomach in knots. When a movie isn't afraid to go places, anything can happen. But Fish Tank never wavers in its dedication to truthfulness. It's an amazing achievment and an enormous inspiration for writers of contemporary realism. Fish Tank has gathered rave raviews, numerous British film awards and won the Jury Prize at Cannes in 2009.